Iran, India and Afghanistan inked a trilateral agreement on establishing an international transit corridor, passing through Iran’s south-eastern port city of Chabahar. 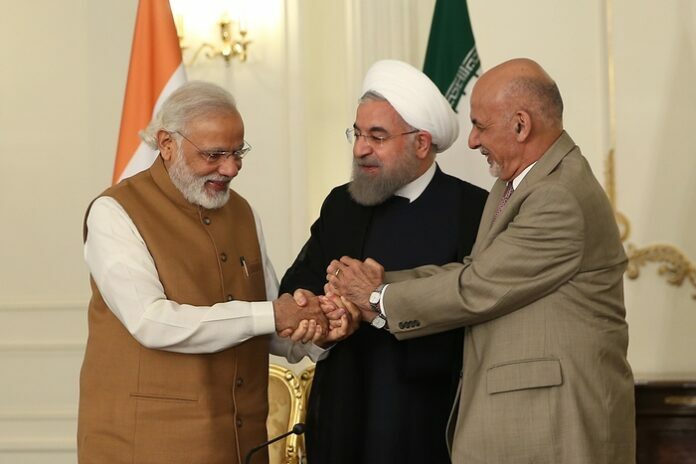 The trilateral agreement was signed by the road ministers of the three countries at a ceremony in Tehran on Monday, May 23, attended by Iranian President Hassan Rouhani, Afghan President Ashraf Ghani and Indian Prime Minister Narendra Modi. The agreement is aimed at bringing about a considerable increase in transit via Chabahar, linking India to central Asia via Afghanistan, and helping Afghanistan have access to the sea. Speaking at a press conference after signing the agreement, President Rouhani said the deal sends the region and the world the message that progress in regional countries will come through cooperation and seizing regional opportunities. Entrepreneurs in Iran, India and Afghanistan can now coordinate their activities with an eye to the international transit corridor, he added. He also underscored that the trilateral agreement on Chabahar is by no means against any country, but serves the interests of the entire region and will be beneficial to regional peace and stability. The Chabahar route will allow Indian goods to reach Afghanistan via the Iranian port of Chabahar without crossing Pakistan’s territory. Chabahar is located in the Gulf of Oman on the border with Pakistan. It is Iran’s closest and best access to the Indian Ocean, and Iran has devised serious plans to turn it into a transit hub for immediate access to markets in the northern part of the Indian Ocean and Central Asia.